Rich in calcium, the Phoenix Worm Larvae – Hermetia illucens - makes an ideal food for most animals that don’t readily feed. They wiggle intensely exciting the feeding process. They also stay fresh in their cup for weeks at room temperature or even longer if kept at an optimum temperature of 50° – 60° F and they do not need to be fed. Even better, they do not make noise. Contact us for details. Our Extra Small Phoenix Worm Larvae (5mm, about 3/16" long) 150 per cup are the perfect size for dart frogs! Also just right for baby turtles, lizards, tiny spiderlings and even carnivorous plants. Pets will be enticed by their intense wiggling when you serve them in a shallow deli lid or petri dish. Bon appetit, little ones! The Small Size Phoenix Worm Larvae (8mm, about 5/16" long) 150 per cup are favorites of larger dart frogs, juvenile or small chameleons, geckos, turtles, and carnivorous plants. Tropical fish enjoy this size, too! Medium size Phoenix Worm Larvae (12mm, about 7/16" long) 100 per cup are the size preferred by many herpsjuvenile bearded dragons, skinks, chameleons, anoles, turtles, and many others. This is also a good size for larger tropical fish. 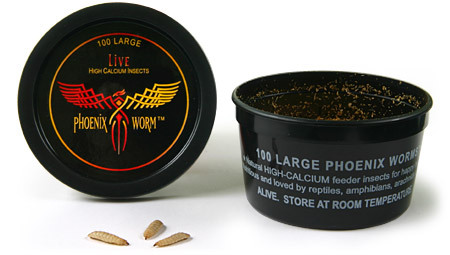 Large Phoenix Worm Larvae (18mm, about 3/4" long) 100 per cup are the right size for larger pets. Adult Bearded dragons, small monitors and veiled chameleons are all huge fans of large Phoenix Worm Larvae! These are also good for larger tropical fish. The Phoenix Worm Larvae is an exellent food for conditioning your pet if you are considering breeding since the calcium content will allow the breeding female to retain and use larger then normal amounts of natural calcium for egg production and keep her in good condition after the labour intensive time of eggs laying. You may find your hard to breed pet is more willing to reproduce after eating some of these calcium rich larvae.